Mexico is the most popular sunspot destination for Canadians every winter. It’s easy to get to the majority of the favourite tourist regions with non-stop flights available from most major Canadian cites. In this issue of Canadian Travel Press, Voices of Travel host, Ron Pradinuk takes listeners to Mazatlan – which after a downturn a few years ago, has seen a major resurgence as a cruise line port – and is a place where Canadians are learning there’s lots more to Mexico than just great beaches and resorts. Staying in a kitchenette unit at the Las Flores Beach Resort, Pradinuk choose to forgo the all-inclusive option. In doing so he discovered a plethora of excellent restaurants, a unique art and cultural community in a city which is both interesting and vibrant. 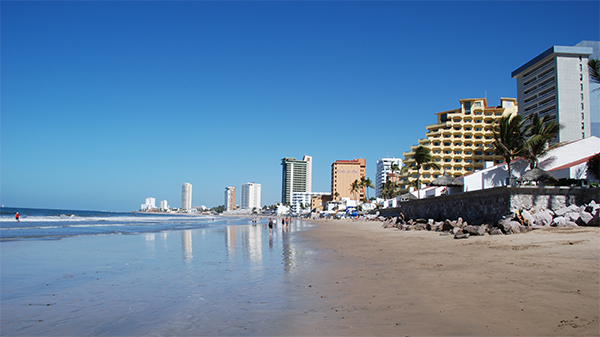 Mazatlán has a stated objective of being the first major “green” city in Mexico and has a good start by offering residents and visitors alike paths and bicycle rentals for fifty cents Canadian a day – with drop off points throughout its long boardwalk and Golden Hotel Zone. Pradinuk talks with Julio Birrueta, director for Go Mazatlán, and Maria Digna, who is in charge of sales at the Las Flores Beach Resort. In this show you will learn why so many are making Mazatlan their winter long-stay destination, returning year after year for the weather, and the reasonable pricing that makes it a budget friendly place–with everything they need to make their decision a good one.